© FNCA 1930For two years in a row now, we've had our beach back. YAY! The river is such a big part of camp: swimming, canoeing, tubing, sunbathing, sand castles, digging water channel through the beach, making minnow traps, diving off the dock, sitting on the beach with friends and family, or just looking down at the river from above. One of the most popular events of the 2011 session was Emily Woofenden's "Slaying the Dragon!" party. 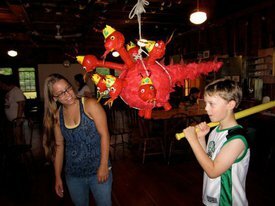 As part of their study of the Book of Revelation, her religion class built an amazing 7-headed dragon piñata © Nancy F. Little 2011and held a camp-wide event to help slay the dragon! First, several people of all different ages spoke about ongoing struggles to conquer their inner demons. Then the Sparks lined up for turns with the whiffle bat while the entire camp cheered loudly at every resounding thwack! 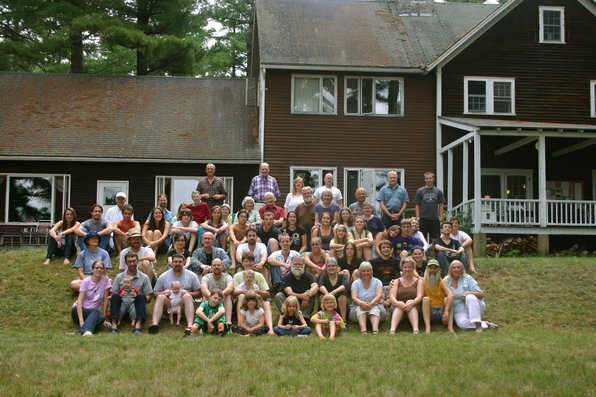 A much smaller but equally appreciated event was this year's Alice F. Vigerstad Memorial Old Lady Canoe Trip on the Saco. 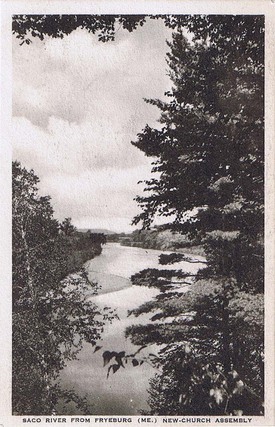 Three wonderful old ladies — Louise Woofenden, Denyse Daurat, and Lois McCurdy — each in their own canoe, were accompanied by five attendants on a leisurely afternoon paddle downstream to the town beach where beach chairs and snack awaited them before the short drive back to camp. We were pleased with our new head cook who, in turn, appreciated both the new bake oven and the newly- © Trevor 2011reconfigured Cooks Quarters above the kitchen. 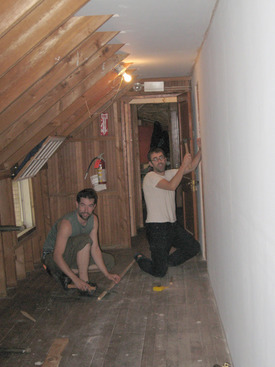 Thanks to a great Work Weekend crew, the walls of old Room 10 were removed and a long wall was built creating a new back hallway, so on the second floor you can now walk from one end of the building to the other without going through the Cooks Quarters. The Board voted to make the Outreach Committee an official FNCA committee this year. It has be operating informally for several years, but now has official status, by-laws, officers, etc. The results of their labors are already evident, too! 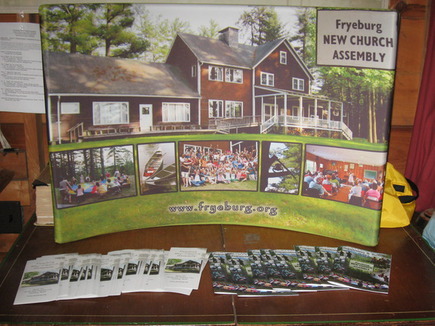 Campers got to see the brand new FNCA Display: a full-color cloth © Trevor 2011banner in a metal tabletop frame. Special thanks to Outreach Committee members Beki Greenwood for her design work and Jon Crowe for both producing the banner and managing the first annual FNCA Display Tour which will see our display set up in a different church each month February-July 2012 as well as at Convention. Other 2011 camp highlights included a dynamic lecture © Beki Greenwood 2011program, a very active Flames group, the still new Opening Weekend Program and Afternoon Book Club, extremely well-attended adult discussion groups after lectures, and several social gatherings in Adrienne Frank Hall.